Some code tweaks to reduce the possibility of sound dropouts and buffer overrun under extremely CPU-intensive circumstances. A new neater, more intuitive UI for convenient sound recording. Other unspecified minor code tweaks, UI improvements and bug fixes. Sonarca Sound Recorder Free is a free program. While it doesn't offer any frills, it is a great basic recording device, and we recommend it. The best of all, it is a FREE sound recorder (for personal & home usage only). This sound recorder is capable of recording various sound input to MP3 audio format. Extremely resource friendly, CPU usage is below 1% on some new computers. Easy to navigate user interface designed for computer rookies to use. This free sound recorder uses the latest Lame MP3 encoder which is generally believed as the the best MP3 encoder. Supports majority of modern sound cards: multi channel/professional/external USB sound cards. Supports several sound cards at the same system. This Sound Recording freeware supports on-the-fly ripping, in other words, it does not generate temporary files during the ripping process. 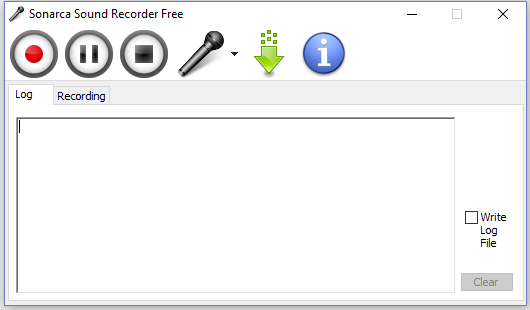 The last but not the least, this Sound Recorder is Windows 10 compatible and works with Windows 7 (64-bit and 32-bit). NOTE: Sonarca Sound Recorder Free is FREEWARE, you can keep it as long as you wish and use it for any personal purpose and home usage. For additional features and commercial or public usage, please consider upgrading to the more powerful Sonarca Sound Recorder XiFi. High-Definition sound recording up to 192000Hz, stereo, 32bit. Record with our proprietary noise-suppression systems to maintain superior sound quality. Support all popular Windows audio interfaces like MME, DirectSound, WASAPI, Kernal Streaming for low latency recording. Supports WASAPI loopbak mode recording without introducing DAC quality loss. Record and save to dozens of audio formats. This sound recorder can seamlessly works together with user provided encoders. Scheduler and fully user defined Global Hotkeys for handsfree & longtime audio recording. Apply various DSP effects to the sound signal. Added new feature: show recording progress and status on the Windows 7 taskbar. Uptodate encoder: Lame 3.98.4, libOgg 1.2.0, libVorbis 1.3.1. Changed the font to make the soft work under 800x600 resolution. Fixed a file renaming bug. Fixed a bug which caused some unicode characters can not be properly displayed on the log tab. Fixed a volume control bug on Windows Vista.